Synopsis (From Goodreads): the cold. Grace has spent years watching the wolves in the woods behind her house. One yellow-eyed wolf—her wolf—watches back. He feels deeply familiar to her, but she doesn’t know why. the heat. Sam has lived two lives. As a wolf, he keeps the silent company of the girl he loves. And then, for a short time each year, he is human, never daring to talk to Grace…until now. the shiver. For Grace and Sam, love has always been kept at a distance. But once it’s spoken, it cannot be denied. Sam must fight to stay human—and Grace must fight to keep him—even if it means taking on the scars of the past, the fragility of the present, and the impossibility of the future. 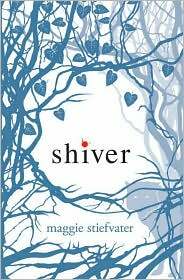 My Thoughts: “I remember lying in the snow, a small red spot of warm going cold, surrounded by wolves.” (p 1. of Maggie Stiefvater’s novel, Shiver) That is how this novel begins and that is what hooked me…a small red spot of warm going cold…the description! Right when you open this book it becomes apparent that the author is comfortable with language and grammar. The entire first paragraph is just explosively descriptive, and not in a gushy, overly forceful way. She really puts you there in the scene, in the mind of the narrator. Speaking of narration, that too is something I thought was well executed in Shiver. It’s done in first person and it shifts between the story’s two main characters, Grace and Sam. Now generally I am -not- a fan of books that shift perspective, but Ms. Stiefvater manages to make it such a seamless transition that the reader has no trouble switching back and forth. That said, I think it’s also made easier because it does not shift EVERY chapter. I also like the unique take on werewolves presented in the story – you don’t see many authors actually attempting new things. Kudos to her for that. The characters themselves, even those not in the forefront of the story, are fairly well developed which of course makes for a more believable, likable tale. Parents should know that though there is a touch of romance in the book, I would say that it’s clean and I would not have an issue with my young nieces and nephews reading it. It’s obviously from the telling of the tale that Grace and Sam have something special. There is a connection there that you simply are able to understand and relate to, instead of having to have the author explicitly tell you “These two are in love. The end.” The story was just so well written and so entrancing that I did not want to put it down. I borrowed this from the Library, but I will be buying my own copy. I’ll also definitely be reading Linger, the sequel to this novel, and Maggie Stiefvater’s other works. This is one of my favorite authors! Shiver is so amazing. I’m so glad you enjoyed it!